Add a little more variety to your M4 Stylin set with these diffuse overlays. 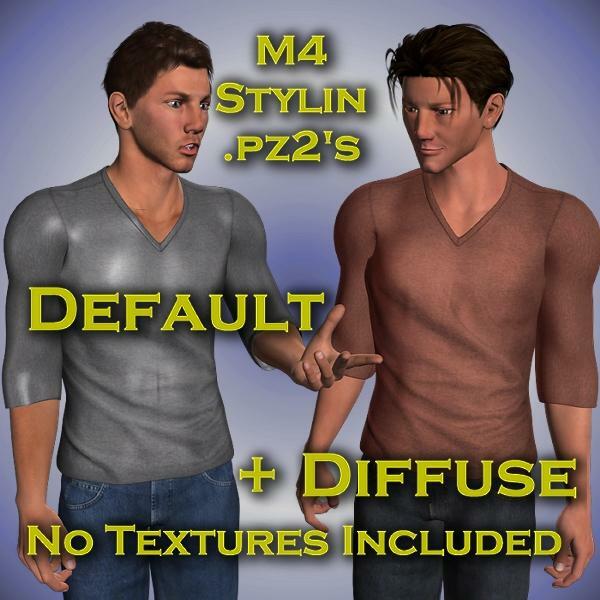 The pz2's call to the Stylin clothing set's default textures (not included) and apply diffuse color overlays to provide a different look to the v-neck and pants. Five default+diffuse pz2's for the v-neck, and one default+diffuse pz2 for the pants. No textures included, only pz2's with diffuse colors added. I would like to say I am a new be at all this, and I am thank full very much for your work.. You did a great job. Spanky (9 years ago) Inappropriate? Thanks for this new mats. The guys on your pictures reminds to the series "2 and a half man". They look like Jack and Alan.